Despite difficult economic times, the number of Americans volunteering in their communities jumped by 1.6 million last year, the largest increase in six years, a new report from the Corporation for National and Community Service finds. The report, Volunteering in America, has data compiled on volunteer trends in all 50 states. Minnesota ranked third in volunteer participation (37.5%) after Utah and Iowa. is a monetary value of $354,075. These numbers account for volunteers placed in both city and public school programs. Volunteers are all ages and participate in a wide variety of activities. Adopt a park/garden: 103 volunteers adopted 40 parks and trail areas and 27 gardens totaling 795 hours. Pick up the Park: 799 volunteers collected 130 bags of trash. 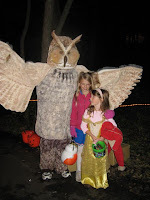 Halloween Party at the nature center: 136 volunteers helped with set up and party activities totaling 824 hours. 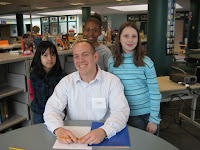 Math program helpers in 2-12 grade classes: 24 volunteers helped 494 students totaling more than 560 hours. Art appreciation volunteers taught lessons to kindergarten through sixth graders: 49 volunteers teach 1,725 students totaling 1,035 hours. Opportunities are available for all ages of volunteers. If interested in learning about these or other volunteer opportunities email Sarah.